Open Decks: 120 sq. ft. Gross Area: 1,008 sq. 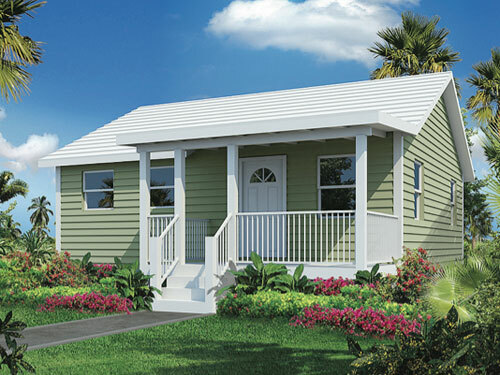 ft.
Also measuring 26 x 28ft., The Dock House II open floor plan consists of two bedrooms and two baths. By adding the en suite master bath option our Dock House II becomes a traditional island style home with the amenities of an upscale residence The covered front porch and rear sun deck combine to provide 1,008 sq.ft. of premium “Island Home” living space. Options include wrap around decks and covered porches, making the Dock House II a perfect weekend retreat or year round residence.